Using Dentsply Bioform? Switch to Justi ViForm today and save money without sacrificing quality! A beautiful, natural-looking multi-layered hardened plastic tooth, ViForm was created for the professional who prefers Vita shades and Bioform molds. Superbly articulated with 0 degree, 10 degree, 20 degree and 33 degree posteriors. The teeth are mounted in a neutral blue background to improve molding selection and shade readability. Technical data (arch size, width and length of maxillary centrals, plus characteristics of shape) are printed on the front of each card. The twelve most popular Vita shades are utilized in the ViForm tooth line. Ten shades also match the Justi Eterna Shade System which is similar to the Dentsply Bioform shade range. 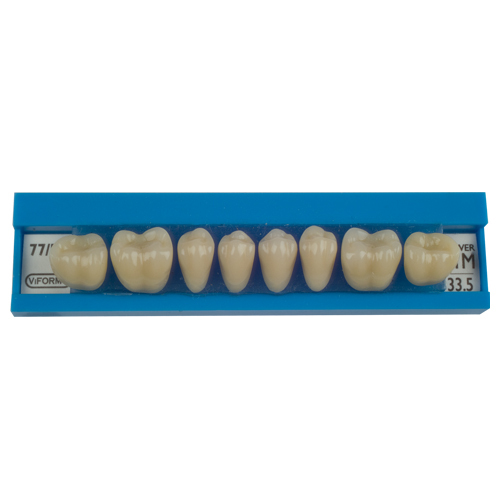 ViForm teeth are made according to ADA Specification #15 for artificial resin teeth. All Justi tooth lines can be professionally cleaned using Renew Denture Cleaner.